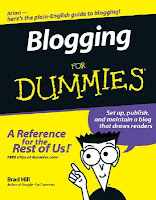 Since I have really been enjoying blogging, I thought I would start picking up some tools to help me learn the ropes and rules of blogging. I picked this book up at Borders last night. Look forward to learning some new things.